A. James Clark Hall is an iconic building for the Clark School of Engineering and the entire University. Clark Hall supports the Clark School’s rapidly growing programs while bringing together disciplines under one roof, encouraging interdisciplinary collaboration and growth. Clark Hall boasts more than 100,000 square feet of instructional and research space with three floors dedicated to the Fischell Department of Bioengineering and the Robert E. Fischell Institute for Biomedical Devices. To help spur an organic flow of ideas, Clark Hall houses an Innovation Lab, in which students from all eight engineering departments work collaboratively on cross-disciplinary research and design work. State-of-the-art optical laser and imaging laboratories feature advanced technology in digital fabrication, rapid prototyping, 3-D printing, optics, and bioinformatics. In the imaging suite, students and faculty have the ability to examine molecular resolution of pathogens that show how a nano-carrier delivers a drug to a specific tumor site. Laser devices and magnetic resonance imagers allow a close examination of cross-sections of the body and brain. A. James Clark Hall supports significant research advancements and biomedical innovations that are underway in the Fischell Department of Bioengineering. Since its inauguration in 2006, the Fischell Department’s undergraduate student enrollment has more than doubled in size to help make it the university’s fastest-growing department. About 85 percent of the students enrolled in the university’s bioengineering graduate program come from the United States, with 48 percent female; both of those numbers significantly outpace graduate programs nationally. Everyone is inspired by solutions to complex problems, and there's not a single person who has not been affected by cancer or some other disease impacting their family. Clark Hall, located adjacent to the Jeong H. Kim Engineering Building, reduced the Clark School's class space deficiency by 20 percent, while bringing together the many disciplines involved with human health innovation under one roof, encouraging interdisciplinary collaboration and growth. Some 7,332 square feet of classroom space and 11,402 square feet of class lab space support instructional capabilities. To help spur an organic flow of ideas between many disciplines, the building introduced flex classrooms and two stories of flexible laboratories to the campus, including wet and dry spaces as well as a vivarium, and was be designed to engage the public with an atrium that greets everyone who enters the building. Anyone from within the campus or greater community is welcome to convene at Clark Hall and participate in a culture of innovation. With our presence here in the D.C.-Baltimore corridor, we may have the largest biomedical research capacity in the world, and when you take advantage of this special location, you can do great things. Clark Hall is being built basically from the bottom up to be a hub of activity—to bring people from elsewhere in the Clark School of Engineering, the University of Maryland, the University of Maryland, Baltimore, from companies nearby, from the FDA to NIH, all with the idea of inspiring new technologies to improve human health. That means students putting their research minds together with policymakers, venture capitalists, and regulatory agents to measure and manipulate cells, tissues, integrated systems, and devices, along the way developing technologies to save lives. Our location allows us to develop relationships with national labs, gaining exposure that wouldn’t happen in other parts of the country. It’s critical that applied work not only exist in the lab, but also that it gets out into the commercial marketplace. A key feature of A. James Clark Hall is the Robert E. Fischell Institute of Biomedical Devices. Devices and technologies developed here are translated into clinical environments around the world, starting with hospitals at the University of Maryland Baltimore, Georgetown University, and Children’s National Medical Center. 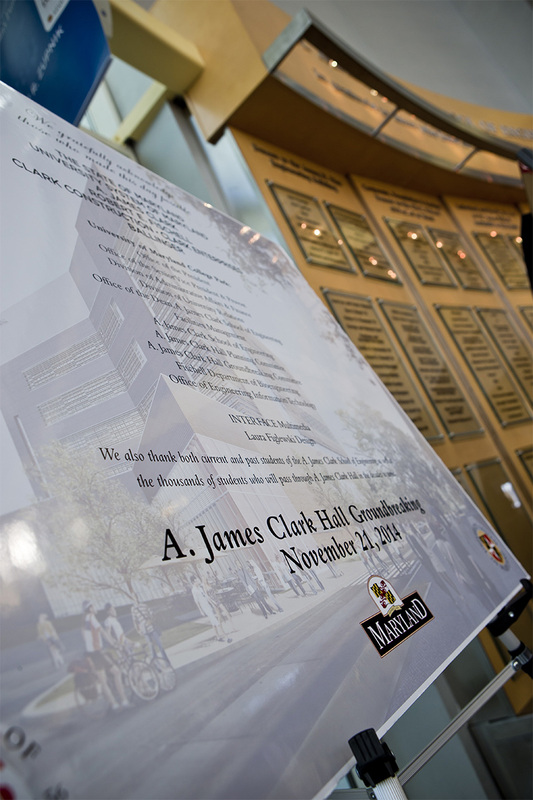 A. James Clark Hall incubates the next generations of bioengineers whose contributions and innovations will propel Maryland’s economy for decades to come. The state’s bioscience and bioengineering industry is one that Maryland has invested heavily in growing in recent years. A new bioengineering headquarters in College Park will push the state towards national leadership in technology commercialization and the creation of technology jobs in this sector. In turn, Clark Hall and the burgeoning biotech industry will help keep Maryland’s smartest students in the state by leveling the playing field with other top-tier universities across the country.